Amazon Business is a marketplace that combines the selection, convenience and value customers have come to know and love from Amazon, with new features and unique benefits tailored to the needs of businesses. Amazon Business provides easy access to millions of products, offers convenient shipping options, including unlimited FREE two-day shipping on eligible orders with Business Prime, and easy and efficient return policies. Now you can conveniently purchase the products you need, save time, and focus on your project where it matters most. D-Tools Cloud customers now have an easy, convenient way to purchase products through Amazon Business. We have partnered with Amazon Business to provide more value for your business. View up to date Amazon branded product data in the D-Tools library and add to your catalog. Get pricing for the Amazon branded products with a 5% discount for D-Tools Cloud users. Quickly have access to D-Tools' Amazon Business storefront which gives you access to millions of products sold on Amazon Business. Search the D-Tools library to add Amazon branded products into your Catalog and Quotes. From the Catalog, navigate to Amazon Business from the Catalog Home page or from the Catalog Brands page. You can also add products in the upper right of the Catalog My Products page. 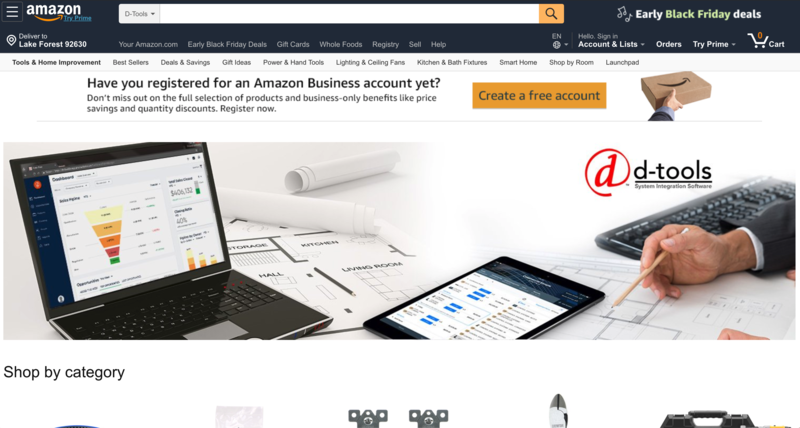 By partnering with Amazon, D-Tools offers a free account signup with Amazon Business that allows you to purchase products directly from Amazon. To learn more and to activate your Amazon Business account, click here. *D-Tools Cloud has started with 35 Amazon smart home products that you can view in the Amazon Business page in the catalog. The D-Tools' Amazon Storefront is a page within Amazon that allows D-Tools users to shop for products related to the integrator business. You can also always search from within the storefront. To get to the D-Tools' Amazon Business storefront, click on the Amazon Business in the Catalog Home page or Brand page. Here you will get a modal that lets you know you can Create a Free Amazon Business account, or you can go Shop the D-Tools' Amazon Storefront. You can now order directly through Amazon Business within D-Tools Cloud for Amazon branded products. To learn more about this, view here. Learn how to Connect.